Contemporary neurosurgery is a high-tech and rapidly developing area of medicine. The latest technology in combination with extensive experience allows carrying out minimally invasive, high-quality neurosurgery. 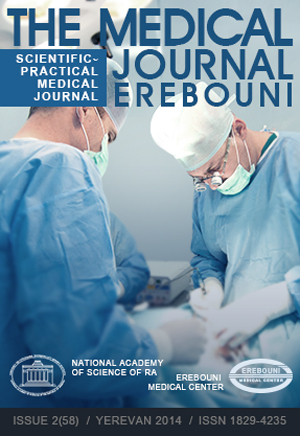 The Department of Neurosurgery of Erebouni Medical Centre was founded in 1998. In 2000 it was integrated with the Department of Neurology, thereby creating a multidisciplinary neurological and neurosurgical clinic managed by professor Mamikon Egunyan (MD, PhD). The Department of Neurosurgery of MC Erebouni performs about 500 surgeries in various diseases of the brain and spinal injuries (traumatic hematoma, fractures and spinal injuries, tumors of the brain and spinal cord), the peripheral nerves and nerve plexus, brain vessels (endovascular treatment of vascular diseases of the brain). It is also performs the surgeries in diseases caused by degenerative changes of the spine: intervertebral hernias, spondylolisthesis, stenosis of spinal canal etc. The diagnostics of complex neurosurgical pathology in department is performed by integrated diagnostic facilities of Center in whole: radiology department, department of endovascular surgery (angiography), department of functional and ultrasound diagnostics. Clinical diagnostic laboratory conducts a full examination of the patients both before and after surgery. The specialists of the department consult also patients in other departments of the Center. At the department operates also the service of "Endoecological Rehabilitation", which carried out an innovative conservative treatment of degenerative diseases of the spine, regardless of their etiopathogenesis. Malignant or benign brain tumors can radically affect the human condition, both in terms of health and in terms of behavior. As a rule, if the tumor is located in an accessible for work of neurosurgeon place and a not interfere with the important parts of the brain it can be removed by neurosurgical intervention. Accumulation of cerebrospinal fluid in the skull, so called Hydrocephalus can be as independent disease or occurs as a result of head injury. The most common procedure for Hydrocephalus treatment is a placement of the shunt in the brain, due to which liquid will flow to the abdomen. The pathologies of the spine including a serious spinal injury, herniated discs, fractured of the vertebrae requires neurosurgical intervention. Therapy resistant Epilepsy with often onsets can be treated by neurosurgical intervention and implantation of vagus nerve stimulator (VNS). Due to the fact that the department is located in the multidisciplinary Medical center of Erebouni it gives possibility to offer to our patients the high-quality diagnostic and therapeutic packages. Effective collaboration with the Department of Neurology, Rehabilitation and physiotherapy implements the comprehensive treatment approach for each patient. traumatic injuries of the brain and spinal cord. traumatic injuries of peripheral nerves. diseases caused by degenerative changes of the spine: intervertebral hernias, spondylolisthesis, stenosis of vertebral canal and others. aneurysms, arteriovenous malformations and carotid-cavernous fistula of the vessels of brain and spinal cord. In addition to the surgical intervention the conservative treatment of degenerative diseases of the spine are conducted as well. One of department's priority activities is "Endoecological Rehabilitation" or "Di bluden Therapy". For patients with a diagnosis of "intervertebral hernia", which does not require surgical intervention to solve the basic problem of disco-radicular conflict the course of rehabilitation therapy for 17 procedures is prescribed . For postoperative patient the course of rehabilitation therapy is prescribed too but just for 10 procedures. The high efficiency of "Endoecological Rehabilitation" is proving by eliminating of inflammation, swelling, pain, local improve of hemodynamics, joint mobility normalization and vertical posture stability increase after therapy. Chair of Neurosurgery, YSMU after. M. Heratsi. , - Intensive treatment of severe traumatic brain injury, combined with injuries of the chest , VII Republican scientific Conference of Young Medical Scientists on topical issues of anesthesiology and intensive care, Alushta 1986.
, Y. Orlov - Liquor-bypass surgery in pediatric neurosurgery , Modern methods of diagnosis and treatment of diseases of the nervous system, part 2, Ufa, 1996.